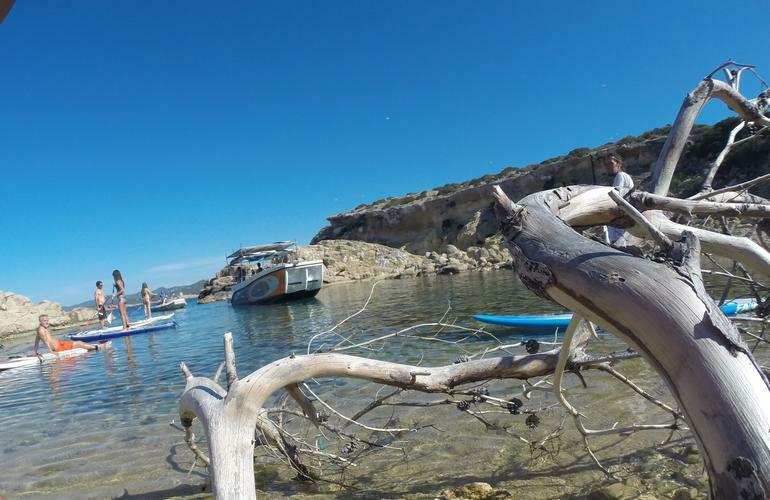 Ibiza is much more than nightclubs, drinks, and party, SUP Paradise Ibiza is a proof that a different scene exists for those, like you, who look for a way to unwind from daily life while enjoying the outdoors. 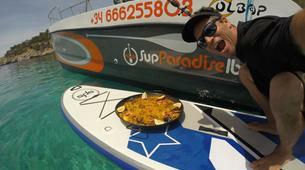 SUP Paradise Ibiza knows that there is a lot to Ibiza, more than meets the eye. 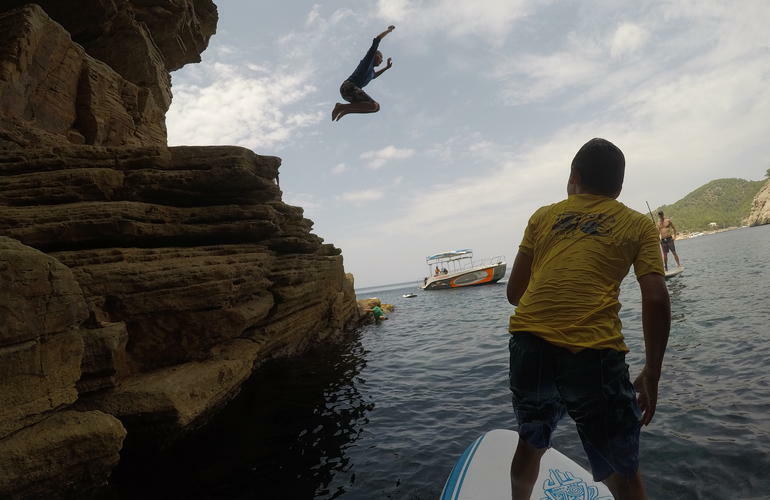 Their love for their island along with a passion for SUP and water sports make them the perfect guides for you. 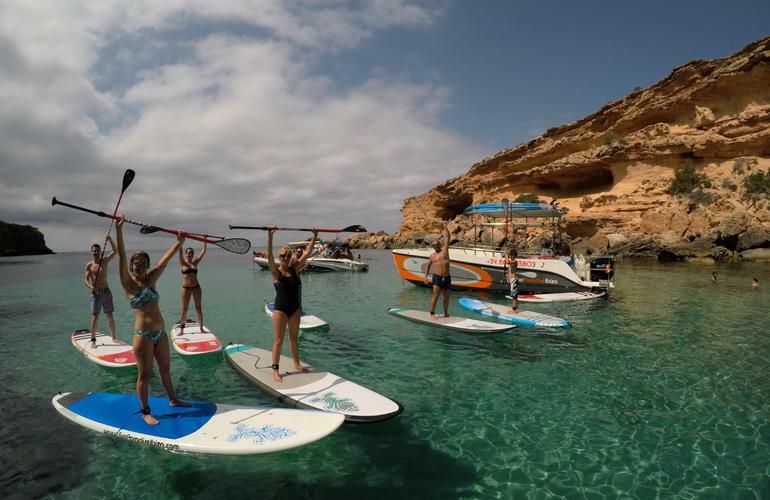 Their knowledge of the incredibly beautiful coast of Ibiza has allowed them to create 3 awesome SUP routes for your SUP excursion. 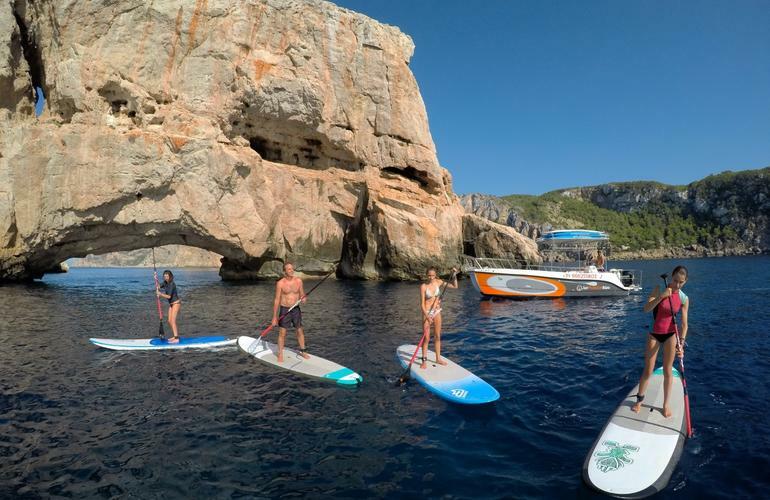 With SUP Paradise Ibiza, you'll discover the best coves of the island, experience the breathtaking sun setting on the Mediterranean or spending a complete day exploring the best-kept secrets of Ibiza. 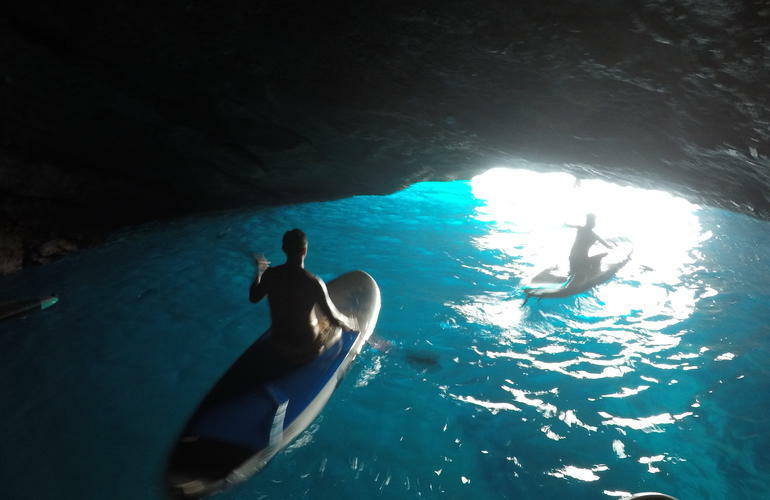 The Best Coves in Ibiza excursions, a 3-hour route, will take you paddling through some of the most beautiful coves on the west coast of the island, such as Cala Conta and Cala Salada (depending on the weather conditions). 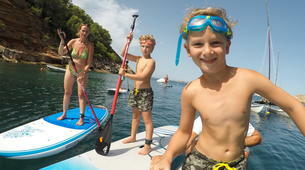 Once at the cove, you'll have a paddle surf lesson and 30 minutes of snorkeling in an incomparable setting. 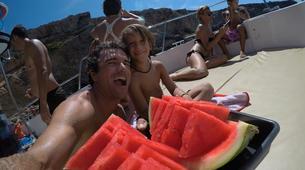 As a plus, you'll be offered fresh fruit and drinks on the boat so you can enjoy a fun return to the port. 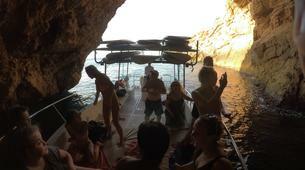 The Sunset in Ibiza excursion will take place during the last hours of sunlight. 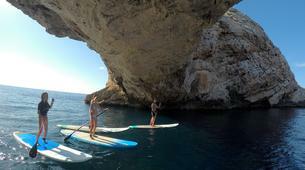 The highlight is, of course, the sunset on board of a SUP paddle board. 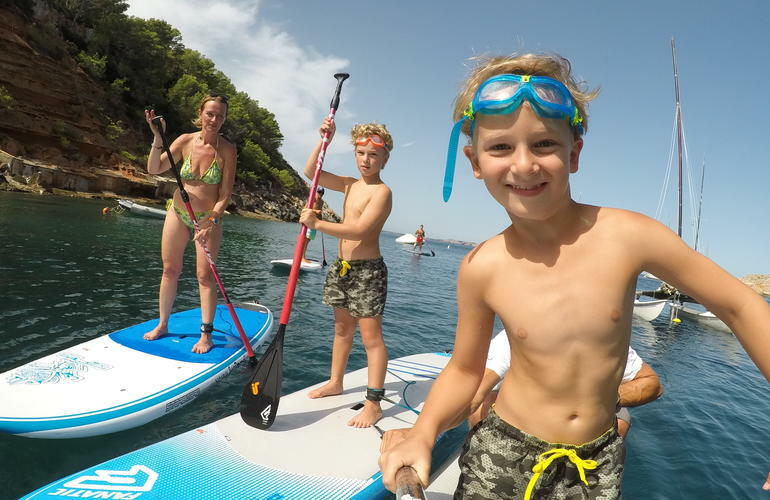 You'll be given a SUP basic course at the destination. Also, the icing on the cake will be fresh mojitos that fit right in with the surroundings. 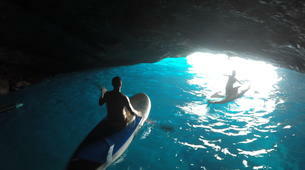 The Best Secret Places of the Island excursion is a full day (7 hours) tour to the most beautiful spots of the island. 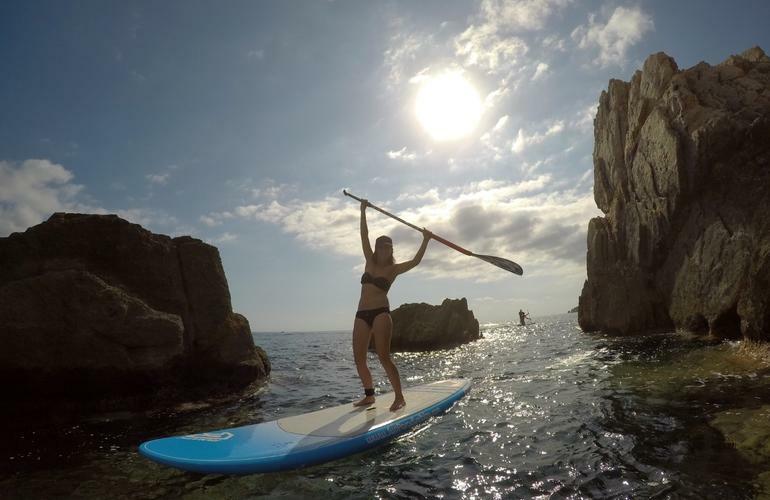 During this time, you'll explore the best coves of Ibiza and its breathtaking surroundings, you'll do some SUP, and snorkel to discover the amazing local marine life. 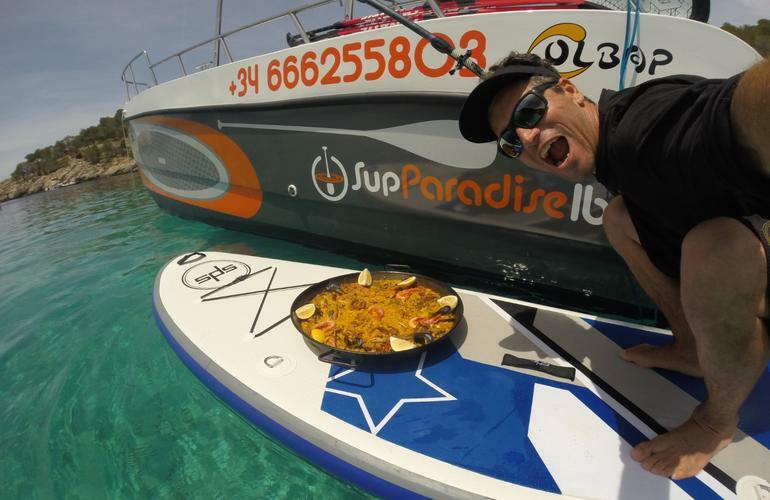 If that was not all, the team will cook a delicious barbecue on the boat! 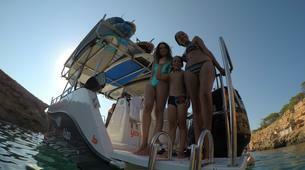 - Departure from the Port of San Antonio on the boat Yaru. 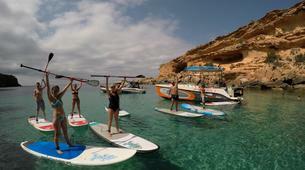 - Customers that have never practiced Stand Up Paddle (SUP) will take a basic course during the trip to location. 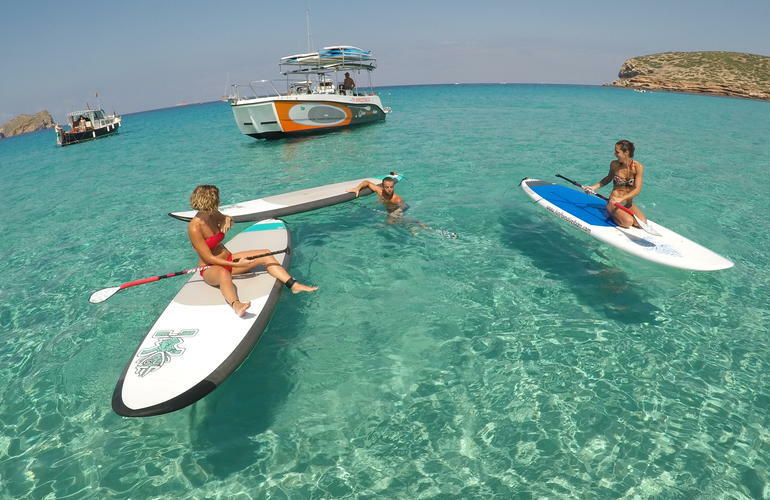 - Once the boat reaches the destination (location will depend on weather & sea conditions), the staff will prepare the boards to start the SUP excursion. 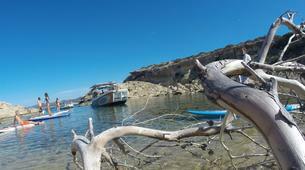 - The excursion will take about 1 hour, with the boat following providing security and support. 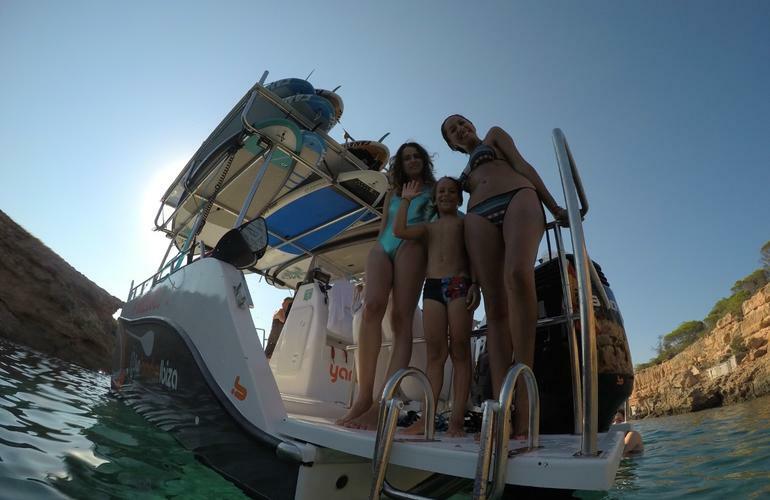 - When you reach the end of the excursion, the boat will anchor and the staff will pick up the boards and will supply the snorkeling equipment for 30 minutes of snorkeling. 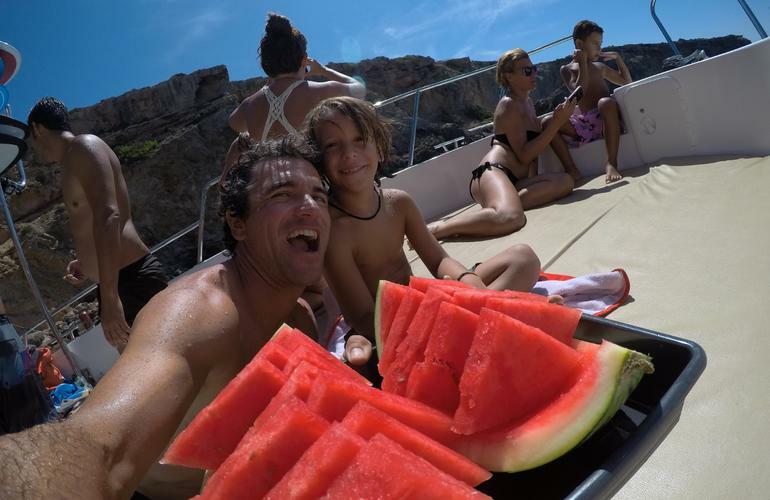 - Once the snorkel has finalized and with the everyone on board, you'll be offered fresh fruits and drinks to enjoy the return to the Port of San Antonio. - The excursion will take about 30 min. with the boat following providing security and support. 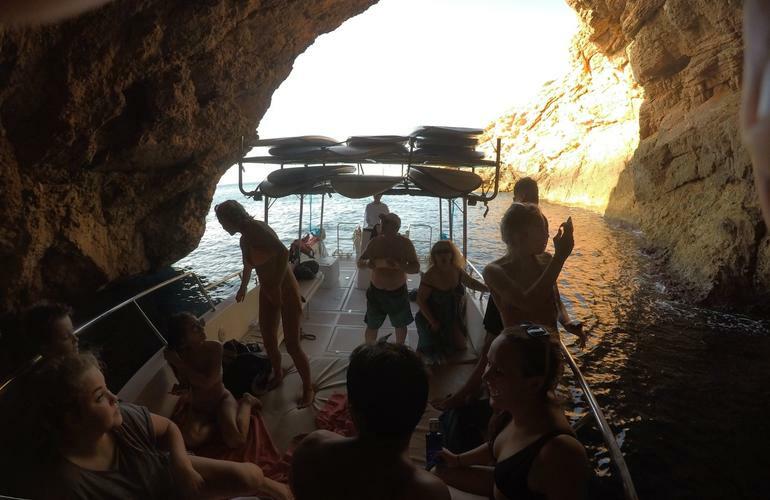 - Once the snorkel has finalized and with the everyone on board, you'll be offered fresh mojitos to enjoy the return to the Port of San Antonio. 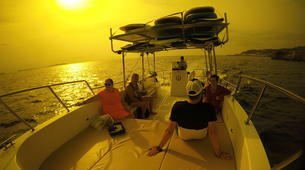 - The excursion will take about 1 hour with the boat following providing security and support. 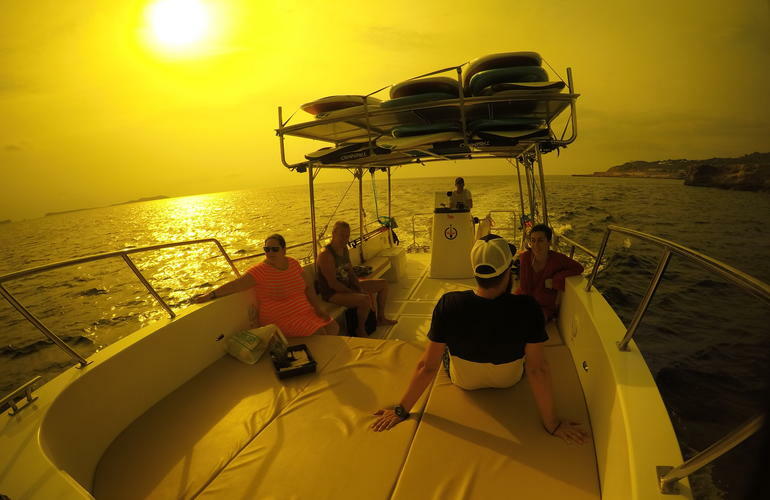 - When you reach the end of the excursion, the boat will anchor and the staff will pick up the boards and will provide the snorkeling gear for a 30 min. 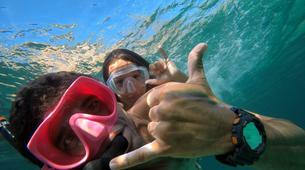 snorkeling trip. - The crew will prepare some appetizers, salads, the barbecue, and desserts to replenish the strength. You'll be able to relax in the chill-out area, paddle a little more, or swim if you want to. - Once everyone is on board, you'll be offered fresh fruits and drinks to enjoy the returning trip to the Port of San Antonio. 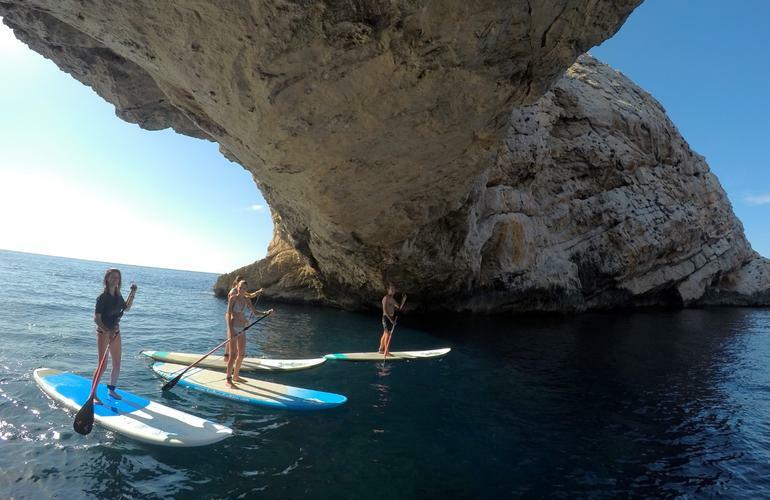 We took a cruise along the coast to a beautiful cove, paddle boarded from there to the next cove whilst the boat accompanied us with the instructor. Then, after an ice cold drink, we got to snorkel and see the fish in the crystal clear waters The instructor was entertaining and patient, looking after me as I was very nervous. The cruise back was relaxing and we dangled our feet from the front of the boat as we ate fresh pineapple and drank cold drinks. Es war ein toller Ausflug mit super netten Leuten. Wunderschöne Buchten und glasklares Wasser. 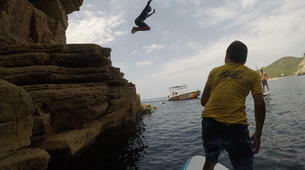 It was the best day in Ibiza!